Our family home was remote, we had no electricity. Then one day my dad announced we were to get a generator, there was great excitement when the house was wired and we could press a button and have light. Even more excitement followed - we got a b&w TV - we all sat enthralled around this little box. After a time the TV began to malfunction, it had a habit of losing sound, we used to say that it was all picture and no sound. Soon the excitement had turned to frustration. After over 40 years of marriage I often think of that little TV. When we have quarreled there can be a period of all picture and no sound, the key for me is to fix the sound as soon as possible, before frustration sets in. I have found three magic words that have helped me bring the sound back. Got myself a Kindle sample of that one! Looks very interesting! And the fact that you said it changed your life… sold! As the maintenance period is waning, we tend to start to see a huge number of “faults” in our partner and grow over time to actively dislike them, often to the stage of “can’t stand to be near them” and “want a swap”. I read a book once that said the SUREST sign that it’s time to throw in the towel is when you or the other person feels contempt and lack of respect towards the other. If you’re already at this stage, they say no amount of counseling can help. In honesty, it’s good to see the comments from @Manxx and @peterma here. They and I are of a similar generation “pre-divorce” or almost so. when you or the other person feels contempt and lack of respect towards the other. If the couple persist for some time, the chart again turns upward and crosses the “X axis neutrality” into a stage of real Love and friendship - much as you might feel towards your children. could be the case - and if it is, then it can be cured with some help. In mild forms the action Manxx suggests can probably be effective and certainly show an understanding attitude. However, my experience was somewhat different. My own “Life Script” was somewhat less benevolent than theirs and my own “games” whilst altruistic (as they appeared to me) - were in many ways self destructive ! I appeared to have a “5 year cycle” and I said "my life is not a Novel - it’s a series of short stories ! " You would not believe how proud of myself I was as I swam back with this new found power ! and I was in my mid 40’s ! This stuff will help some more than others, but for anyone with young children to rear themselves - it is huge ! My thanks to all threeof you ( & @CoinLady ) for your contributions and I hope we have managed to help the lad towards a resolution between us. Which seems to be struggling a bit to “get off the ground” and have a stab at the "Why " of it please . Fathers day is a day to show your emotions, feelings, and reapect for your father. We need to respect our parents as much as we can. A father is the most faithful person you habe in your life along with your mother. So, always make them happy! I think father see his shadow in his child as he want him to become like him and make him proud. A father teaches us how to talk, how to walk, how to eat, and how to handle others. My father is my mentor, my teacher, and my everything. I want to make him feel proud! Yesterday (19th November) was “International Mens Day” - but nobody seemed to notice - I looked at the website, but was rather disappointed about it’s apologetic tone ! "This year, the theme for International Men’s Day is positive male role models. Organisers have cited the effect of the number of children growing up with a suitable male role model and the effect that this could have on the rest of their lives." I’m not sure that was what it was meant to say - I rather think the word “with” should have read “without” ! Help us end the cruel & degrading treatment of families by the government. " That’s 200 chidren a day being victimised by secret “judgements” of officialdom ! - in the uk alone. And only 84 men a week commit suicidein the uk ! Today (20th November) Is International childrens day - Another one you will not have heard of ! 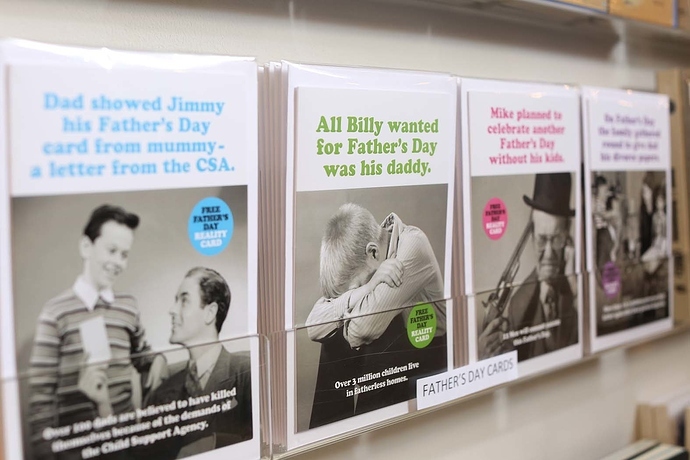 I wonder how the 4 million children living without fathers in the uk feel about that ? Find out how one man’s experience in the secret family courts led to the creation of Fathers4Justice, one of the world’s leading campaign groups." Fascinating man, with 80,000 families signed up and providing help and advice to other desperate families - even to the likes of Guy Richie in his battle with Madonna ! Amazing journey and well done mate for taking down the “desperate” image and putting up a professional attitude which barring further “Foul Play” by the authorities and others, is bound to succeed. This little biography is powerful stuff and well worth the read ! 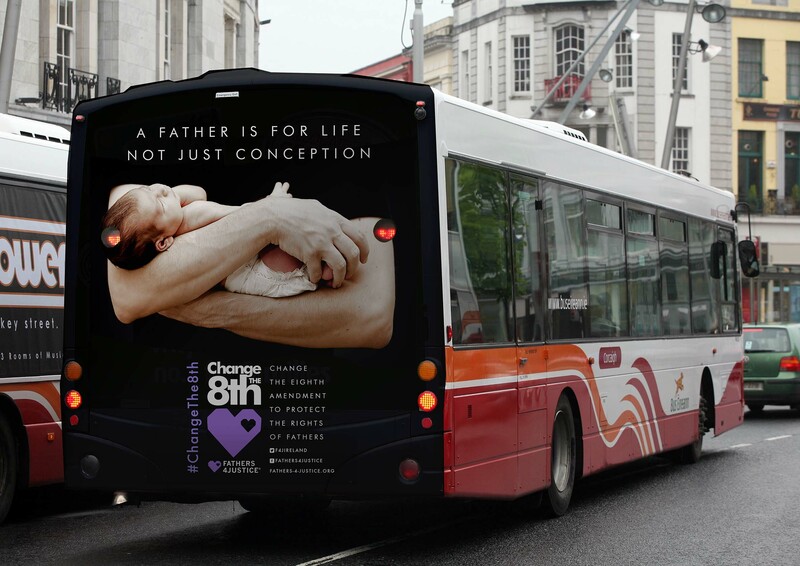 The ad featured a picture of a man cradling a new born child with the words ‘a father is for life not just conception’. Cork Pro Choice group later apologised to F4J and paid damages for libel after claiming the campaign ‘promoted’ domestic violence. You an see why “they” are so damn scared of this man, his partner and their followers. Interestingly 84% of the public actually Agree with his main demand as demonstrated by this You Gov poll ! Which seems to demonstrate that the law is completely wrong in validating the claims to “victimhood” of a very small minority of vociferous and strident “others” ! Men seem to be making rational choices which are less “Paternal” nowadays !